The babskin multi-purpose C shaped nursing pillow provides support and comfort to both you and your baby while breastfeeding. The pillow supports the baby in the optimal position for breastfeeding which reduces discomfort for parent and supports your baby's spin. The soft clean while quilted cover provides a luxury soft feel and can be washed for extra hygiene. 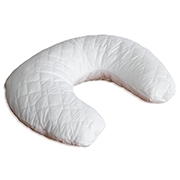 The babskin nursing pillow can also be used pre-pregnancy. The C shape has been ergonomically designed to sit comfortably around your tummy whilst pregnant to offer extra support. Pregnancy pillow - Place the pillow between your knees and ankles or around your back to help ease pressure points. Place the pillow under your tummy as a sleeping wedge to add comfort whilst sleeping. Feeding pillow - Place the pillow securely around your waistline to provide support and comfort to both parent and baby during breast or bottle feeding. Baby sitting pillow - Sit baby into the arch of the pillow and use as a support aid for sitting.